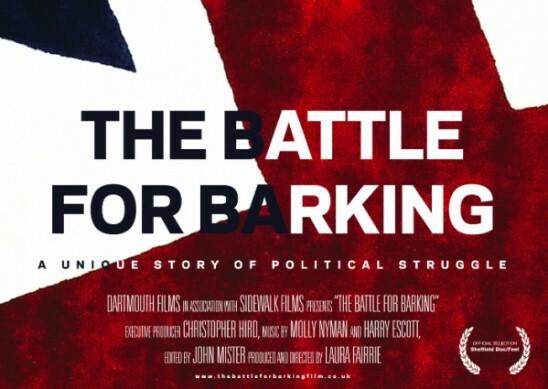 On Wednesday 2 February, Arc in partnership with Studio 3 Arts and The Filim Company, hosted a special screening of the 2010 documentary film 'The Battle for Barking' at The Malthouse Studios. Filmed, directed and produced by Laura Fairrie, the film was shown in Arc's Studios to a packed house comprising of Barking & Dagenham Councillors, Borough representatives and community members. The flm was followed by a special Q&A with the filmmaker and Barking's Labour MP Margaret Hodge. To watch The Filim Company's trailer of the event, hosted in partnership with Arc and Studio 3 Arts, visit YouTube: 'The Battle for Barking'. 'The Battle for Barking' records a historic moment in British political history through the microcosm of one constituency. Made over the course of a year, the film follows two very different political opponents as they battle towards the 2010 General Election. As it charts the rise and fall of the BNP, it also gives an extraordinary insight into the workings of the 'BNP family', and into the working class disillusionment with Labour that fuelled their campaign. The film is an honest, moving and humorous portrait of the people of Barking - and shows why, even as a troubled and divided community, they still chose to say "no" to the BNP. Sponsored by BTP, Arc is presenting a special event featuring a double bill performance of Boy X and Pact in London this month. Taking place at Network Theatre in Waterloo on Monday 21 February, the evening features both of Arc's latest anti-weapon and gang crime performances, Boy X and Pact, which are currently touring around London and nationally in the spring. Tickets are free of charge but strictly limited on a first-come, first-served basis - for more details, please email Nita Bocking or call 020 8594 1095, or register on EventBrite. Also see our brand new Pact video - commissioned by BTP, this mini-documentary takes a look at the play and its development, including performance and Q&A footage and special interviews. Click here to buy your ticket to support Arc Theatre!